People Matters will use funding to launch a social networking site for the HR community. India’s first fund solely for HR ventures announced its first investment in People Matters on May 8, 2012 at a launch event in Mumbai. 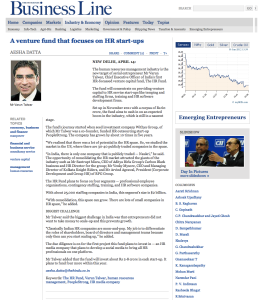 The Gurgaon-based investee, a media and knowledge platform in the HR space, has secured Rs. 4 crore in funding from The HR Fund, to launch a social network for the human resource community, increase its subscriber base and strengthen the firm’s organizational structure. 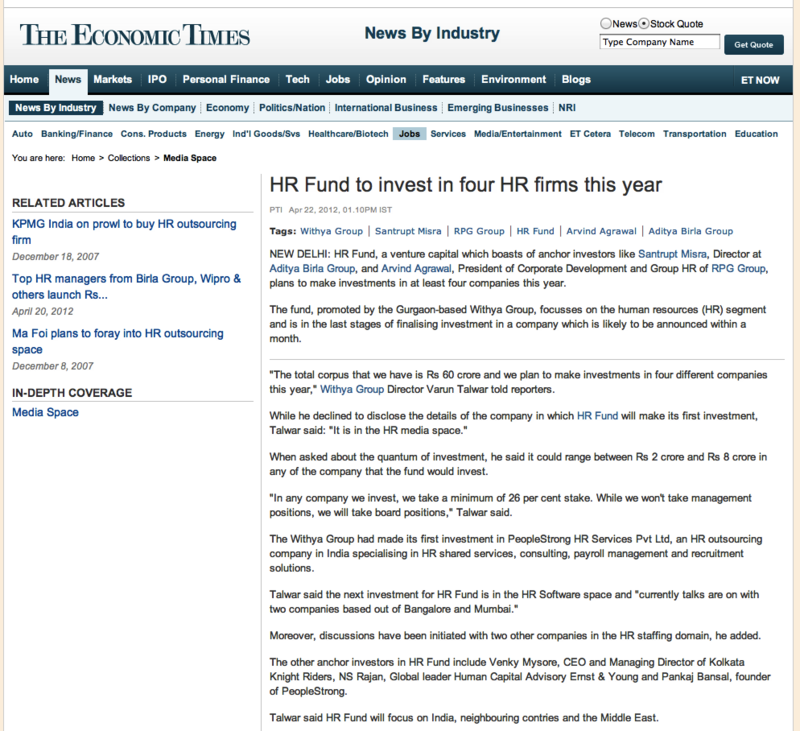 NEW DELHI: The HR Fund, a Rs 60-crore VC fund created by top human resource managers, has finalised HR media platform People Matters as the first start-up it will invest in. The fund has pumped in Rs 4 crore in the start-up in the first round. Varun Talwar, CEO, the HR Fund, confirmed the investment. “We will be making more investments in future rounds,” he adds. NEW DELHI: HR Fund, a venture capital which boasts of anchor investors like Santrupt Misra, Director atAditya Birla Group, and Arvind Agrawal, President of Corporate Development and Group HR of RPG Group, plans to make investments in at least four companies this year. The fund, promoted by the Gurgaon-based Withya Group, focusses on the human resources (HR) segment and is in the last stages of finalising investment in a company which is likely to be announced within a month. 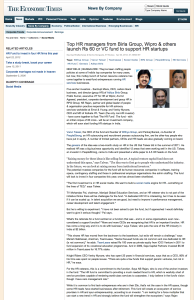 Saumya Bhattacharya & Devina Sengupta, ECONOMIC TIMES Bureau Apr 20, 2012. 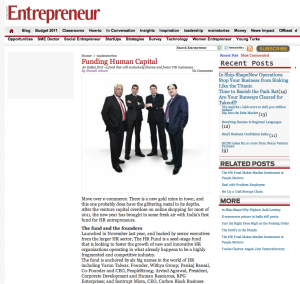 NEW DELHI | BANGALORE: They’ve been crafting people policies at some of India’s top companies for many years, but now, this motley bunch of human resource veterans has come together to seed-fund entrepreneurs running HR services businesses. 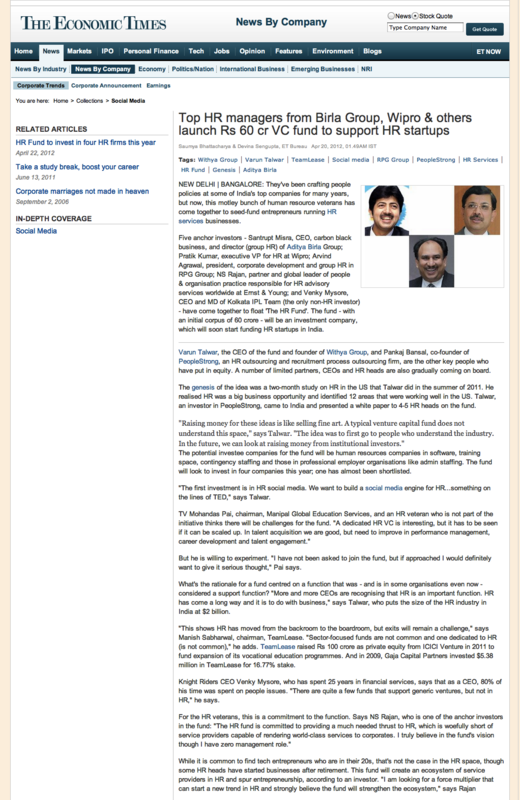 Five anchor investors – Santrupt Misra, CEO, carbon black business, and director (group HR) of Aditya Birla Group; Pratik Kumar, executive VP for HR at Wipro; Arvind Agrawal, president, corporate development and group HR in RPG Group; NS Rajan, partner and global leader of people & organisation practice responsible for HR advisory services worldwide at Ernst & Young; and Venky Mysore, CEO and MD of Kolkata IPL Team (the only non-HR investor) – have come together to float ‘The HR Fund’. The fund – with an initial corpus of 60 crore – will be an investment company, which will soon start funding HR startups in India. The human resources management industry is the new target of serial entrepreneur Mr Varun Talwar, Chief Executive Officer of India’s first HR-focussed venture capital fund, The HR Fund. The fund will concentrate on providing venture capital to HR service start-ups like temping and staffing firms, training and HR software development firms. Set up in November 2011 with a corpus of Rs 60 crore, the fund aims to cash in on an expected boom in the industry, which is still in a nascent stage. The fund’s journey started when seed investment company Withya Group, of which Mr Talwar was a co-founder, funded HR outsourcing start-up PeopleStrong. The company has grown by about 10 times in five years. 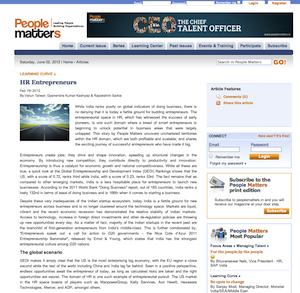 “We realised that there was a lot of potential in the HR space. So, we studied the market in the US, where there are 30-40 publicly traded companies in the space. 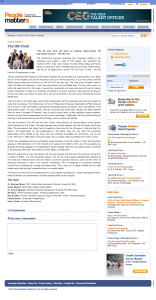 In 2010 Varun Talwar researched on the US market to find out which ideas had scaled up in the US. He found ideas from 10 key sectors had scaled up, HRO, RPO, Payroll, Temp Staffing, Contingency Staffing, Executive Search, HR Consulting, PEO, Online Staffing, and HR Software. While in US there were overall about 30 companies, i.e. about 2 to 5 companies in each of these sectors that were publicly traded, in India there was only 1 company. That’s when he felt there was a need to start a fund that would focus only on HR Space. An Indian first—a fund that will exclusively finance and foster HR businesses. Move over e-commerce. There is a new gold mine in town, and this one probably does have the glittering metal in its depths. After the venture capital overdose on online shopping for most of 2011, the new year has brought in some fresh air with India’s first fund for HR entrepreneurs. While India ranks poorly on global indicators of doing business, there is no denying that it is today a fertile ground for budding entrepreneurs. The entrepreneurial space in HR, which has witnessed the success of early pioneers, is one such domain where a breed of smart entrepreneurs is beginning to unlock potential in business areas that were largely untapped. 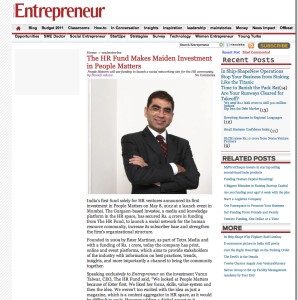 This story by People Matters uncovers unchartered territories within the HR domain, which are both profitable and scalable; and shares the exciting journey of successful entrepreneurs who have made it big. 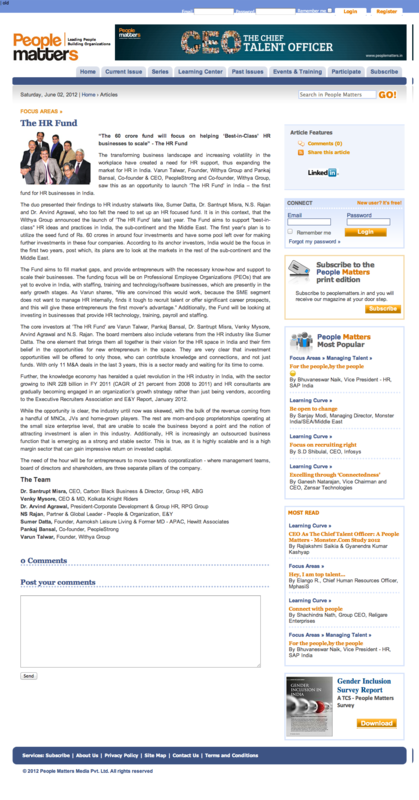 The HR Fund, the first seed venture capital fund for HR entrepreneurs in India was launched on the November 24, 2011in Mumbai. 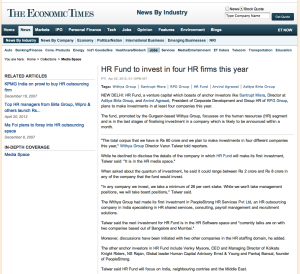 The HR Fund is an investment company that funds HR companies in India with the objective to build best-in-class HR service and product providers of HR in India. 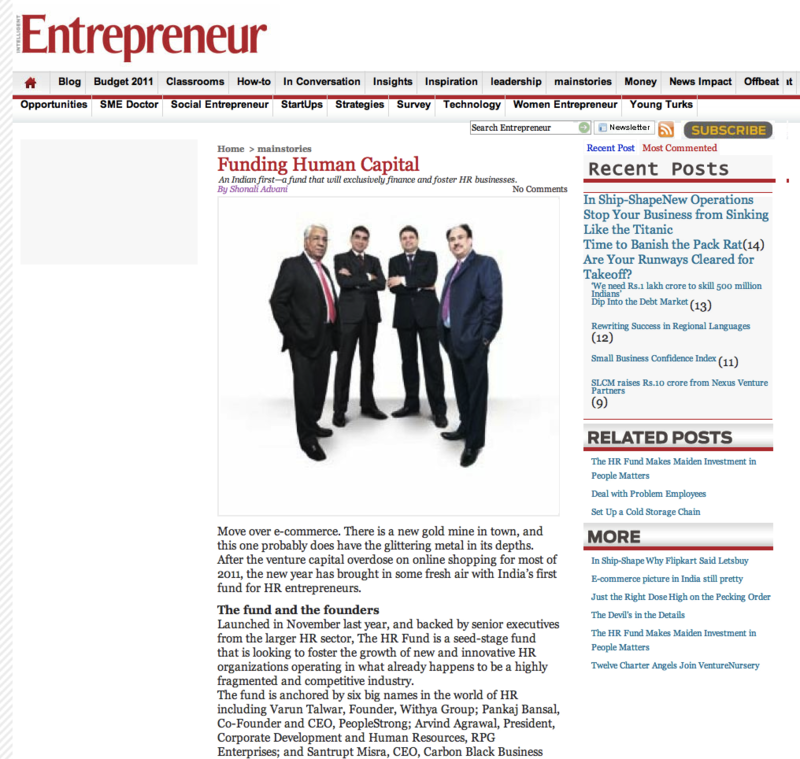 As of now the fund has one company in its portfolio, PeopleStrong HR Services. The fund was created by people from different walks of life with a common objective: investing in the youth power of the HR entrepreneurs. Dr. Santrupt Misra from Aditya Birla Group, Dr. Arvind Agarwal from RPG, Venky Mysore from Kolkata Knight Riders, NS Rajan from E&Y, Pankaj Bansal from People Strong and Varun Talwar from the Withya Group have come together to start the fund that aims to grow to INR 60 crore. in the first stage of investment. “We need HR services providers to make our companies best-in-class, there is a needs to give a path for those HR entrepreneurs who struggle with bright ideas,” shared Dr. Agarwal. The fund will be investing in PEO services (Professional Employer Organization) that focus on compensation and benefits administration, HR Software, Training, Payroll and General Staffing.